Published below are extracts from the draft document on world perspectives discussed at the December meeting of the international executive committee of the Committee for a Workers’ International (CWI). WE ARE LIVING through one of the most dramatic periods in history. The Greek workers, followed by the Portuguese and Spanish, are in the vanguard of the movement against endless austerity. No one can now argue that the working class is passive in the face of the onslaught of rotten and diseased capitalism. In a series of epic general strikes, they have resisted. They have yet to create a mass party and leadership worthy of them in the battle between labour and capital that will dominate the early 21st century. It is the task of the Committee for a Workers’ International (CWI), through the theoretical clarity of our ideas matched to a programme of action, to help create this new leadership, which can ensure victory to the working class. The unstable character of world relations – which can result in the outbreak of conflict in many areas of the world at any time – is indicated by the recent clashes between Israel and Hamas in the Gaza Strip. This was restricted to the exchange of rocket fire and a ceasefire agreement has now been reached. But the war could break out again and a ground assault by Israel against Gaza cannot be ruled out, which in turn would provoke turmoil throughout the Middle East. At the same time, a new regional war or wars are still possible. Syria is a powder keg with the Assad regime besieged and facing possible overthrow but with an opposition that is also divided along sectarian lines. Socialists cannot support either Assad or the opposition, but have to steer a clear independent path towards those masses we can reach with a class programme and perspective. Some of the minorities still seek shelter under the wing of Assad for fear of the consequences for them of an opposition victory, which clearly enjoys predominant support from the majority Sunni population, with a significant and growing influence of al Qaeda-type organisations. Moreover, the intervention of Turkey against the Assad regime has ratcheted up the tension between the two countries. Armed clashes could take place between them, which could then spiral out of control. The intervention of Shia-dominated Iran on the side of their co-religionists in Syria cannot be ruled out. Equally, the conflict could spill over into the Lebanon with the outbreak of sectarian conflict. This, in turn, could lead to Israel seeking the opportunity to launch air strikes against Iran’s alleged nuclear facilities, which would undoubtedly lead to retaliation with Iranian and Hezbollah rockets striking Israeli cities and facilities. In the current conflict, the Israeli regime and the wider population have been taken aback by the capacity of Hamas rockets to strike in the very heart of even Tel Aviv. The CWI opposes the so-called ‘surgical strikes’ of Israel – which are nothing of the kind – that have resulted in at least 160 Palestinians being killed. But neither do we support the methods of Hamas, which has unleashed indiscriminate rocket fire into the heavily populated towns of Israel. This has only served to drive the population of Israel into the arms of Netanyahu, with a reported 85% supporting retaliatory action and 35% now supporting a ground invasion of Gaza, in which hundreds and thousands of Palestinians as well as Israelis would be killed and maimed. The Palestinian people have the right to resist the Israeli government’s terroristic methods but this can be best accomplished through mass movements against the encroachments in the occupied territories – with the aim of splitting the working class of Israel from support for the vicious Netanyahu regime. In the event of an invasion of Gaza or anywhere else in the occupied territories, the Palestinian people have every right to resist, with arms if necessary, against the invaders. NOTWITHSTANDING THE influence of geopolitical factors such as wars on the course of events – which can seriously alter perspectives in some circumstances – the main features of the present situation are the deepening crisis of world capitalism and the combative response to this of the working class and the poor. This is symbolised by the magnificent reawakening of the South African working class led by the miners. The heroic strikes, like the earlier revolutions in the Middle East and North Africa, have inspired the working class in the advanced industrial countries. An element of ‘South Africa’ could also be transported to Europe through a similar movement within the trade unions to overthrow those leaders who refuse to organise the working class to resist the onslaught of capitalism. Following the miners other sections of the South African working class resorted to action in a strike wave which is currently the biggest and bloodiest in the world. This has also been characterised by a high degree of consciousness, of socialist consciousness by the working class – a legacy which was not completely wiped out following the abortive revolution of the 1980s, which preceded the ending of apartheid. This is expressed in the demand for new fighting unions for the miners in place of the utterly corrupt mineworkers’ union, the NUM. Confronted with an equally corrupt ANC, the miners – with the assistance of the Democratic Socialist Movement (DSM – the South African section of the CWI) – have launched the call for a new mass workers’ party. This will strengthen a similar demand for independent working-class representation in all of those countries – the majority – where the mass of the workers have no party, even one which only partly represents them. Even The Economist magazine, the voice of international big business, has stated: "The best hope for the country in years to come is a real split in the ANC between the populist left and the fat-cat right to offer a genuine choice for voters". This seems surprising if not incredible at first glance. No capitalist journal advocates this for Britain! Yet what alarms The Economist is that so discredited has the ANC become – a gulf of Grand Canyon proportions now exists between the ANC’s lords, chiefs and kings, and the working class – that the impoverished masses have begun to turn sharply to the left and embraced real fighters and socialists, the members of the DSM. They will therefore move heaven and earth to try and prevent the masses moving in our direction, even if that means setting up a ‘populist’ alternative to a real mass workers’ party. THE MOST IMPORTANT event in the past period, at least in the capitalist West, was the re-election of Obama in the US elections. He was the first president to be re-elected since 1945 with an unemployment rate above 7.5%. Some strategists of capital – including some who imagine they are, like George Osborne, the Tory Chancellor of the Exchequer – have drawn totally false conclusions from this election. They argue that the main reason why Obama was elected was because the American people blamed Bush, the previous president, for their present economic catastrophes. This undoubtedly was a factor but it was not the only one and not decisive. A big polarisation took place with Obama voters – despite their disappointment since he was elected – turning out to prevent the candidate for the 0.01%, the rich, the plutocrats, from effectively winning the election through Romney. There was a real fear of what a Romney victory would mean in turning back the wheel of history and undermining welfare, the limited health reforms, etc. This helped the turnout, which although not as high as 2008, was nevertheless quite high by historical standards. The popular vote was closer with Obama winning by 50.8% to 47.5% but, crucially, the majority of women supported him, with an even bigger majority of young women. He also won 80% of minority voters – Latinos and African-Americans, of course, while significant sections of unionised workers such as the auto workers, worked for and supported him. In this election it was not just a question of the victory of ‘lesser evilism’. That was there, of course, but significant layers were also prepared to give ‘more time’ to Obama to ‘fix the economy’. He will not, of course, be able to do this because of the character of this economic crisis, which will be drawn out. The marvellous result of the Socialist Alternative candidate in Seattle for a Washington state House of Representatives seat, with a splendid 28% of the votes, was a triumph not just for the American comrades but for the whole of the CWI. It was confirmation of our idea of standing independent workers’ candidates leading to a new mass workers’ party. Moreover, this took place in the very heart of the strongest capitalist power in the world. This vote is a harbinger of what can be expected elsewhere, particularly in South Africa and Europe in the next period, and shows the potential which dialectically exists in the US for the ideas and programme of socialism. The heritage of social-democratic and Stalinist betrayals does not exist in the US. This makes it more favourable terrain for the genuine ideas of socialism than most places in Europe and elsewhere at this stage. So also is the victory of Obama from our point of view. His second term could prepare the way for a third party, but this time a popular, radical and socialist party of the working class. Of course, all perspectives are contingent on how the economy develops in the US and throughout the world. THE US ECONOMY – which is one of the few to regain the production levels of pre-2008 – has slowed to its weakest pace since 2009, growing at less than 2% while the world’s biggest economies have lost steam simultaneously. If the Republicans refuse a deal with Obama, if the US topples off the fiscal cliff, this could almost automatically plunge the world economy – which is basically stagnant – into a new deeper recession. The interests of capitalism should logically compel the Republicans to seek a deal with Obama. But the political system in the US, designed originally for an 18th century population of predominantly small farmers, is now completely dysfunctional, along with the Republican Party. Obama, in one of his more revealing outbursts speaking to American bankers in 2009, stated: "My administration is all that stands between you and the pitchforks". But in the election, this did not earn him the support of the American bourgeois as a whole who favoured Romney in the main. This just goes to show that a class does not always recognise its own best interests! It is the strategists and the thinkers of the ruling class, sometimes in opposition to those that they supposedly represent, who are prepared to stand up for the best interests of the capitalists and chart a way forward. The problem for them today is that the choice is between different roads to ruin for capitalism. This raised the vital question of the role of innovation in the development of capitalism, and particularly in driving forward the productivity of labour. The authors of the above study concluded that there have been "three industrial revolutions" since 1750 that have been crucial in the development of capitalism. The first was roughly between 1750 and 1830, which created steam engines, cotton spinning, railways, etc. The second was the most important with its three central inventions of electricity, the internal combustion engine, and running water with indoor plumbing, in the relatively short period of 1870 to 1900. Both these revolutions required about 100 years for the full effects to percolate through the economy. After 1970, productivity growth slowed markedly for a number of reasons. The computer and internet revolution – described by the authors as industrial revolution three (IR3) – reached its climax in the dot-com era of the late 1990s. But its main impact on productivity, they say, has withered away in the past eight years. They conclude that since the year 2000 invention has been largely concentrated on entertainment and communication devices that are smaller, smarter and more capable but do not fundamentally change labour productivity or the standard of living in the way that electric light, motorcars or indoor plumbing did. This is not to say that there are not the potential inventions for enormously lifting productivity but the dilemma is the current state of capitalism in decline, which is incapable of developing the full potential of the productive forces. The tendency for the rate of profit to fall – and actual falls in profitability – discourages the capitalists from taking up inventions which can develop the productive forces. Then there is the problem of ‘demand’ which in turn has led to an ‘investment strike’, with a minimum of $2 trillion of ‘unemployed capital’ in the cash piles of US companies. And, on top of this, exists the colossal debt overhang. Satyajit Das in the Financial Times berates the American bourgeois who "seem unable to handle the truth – the prospect of little or no economic growth for a prolonged period… Ever increasing borrowings are needed to sustain growth. By 2008 $4-$5 of debt was required to create one dollar of US growth, up from $1-$2 in the 1950s. China now needs $6-$8 of credit to generate one dollar of growth; an increase from $1 to $2 15-20 years ago". Capitalism faces not one crisis but a chain of crises. They are trying to reconcile the working class to the prospect of little or no growth and therefore of severely reduced living standards, as Greece demonstrates. We must counter this through our programme and emphasise the limitless possibilities – evident even today – if society was organised on a more rational, planned way through socialism. THE ECONOMIC CRISIS in Europe is the most serious facing world capitalism. So intractable does the crisis appear, with austerity clearly not working, that a spat has broken out, with the IMF warning against the ‘excessive austerity’ applied by national governments in Europe with the benediction of the EU authorities and the European Central Bank (ECB). On the one side the ECB has sought to implement, like the US Federal Reserve and the Bank of England, a form of Keynesianism through the purchase of government bonds as well as cheap loans to some banks and countries. On the other hand, these very same authorities – the ‘troika’ – have been the instruments for austerity policies. They have been stung by the implied criticism of the IMF, which has pointed out that a negative ‘multiplier effect’ operates when severe austerity is implemented – cuts in government expenditure, loss of jobs, etc – and therefore reduced income to the state. The ECB and national governments counter with the ‘absolute necessity’ to cut state spending, accompanied by all the other measures of austerity, privatisation, etc. Despite all the pleas and expectations of growth, austerity has had the effect of snuffing out even the economic embers that remained during the crisis. It is true that Keynesian policies have failed to generate growth. In the current situation, it is like ‘pushing on a piece of string’. This has led born-again Keynesians, such as former Thatcherite monetarist Samuel Brittan, to lobby for bolder measures; he advocates what amounts to a giant game of ‘treasure hunt’ in a desperate attempt to get the economy moving again. He suggests, only half-humorously, that hordes of cash should be buried and then the adventurous souls who discover it will then go out and spend it! There is no indication of this happening, however. The largesse that has been distributed so far has been used to clear debts not to increase spending. This is an indication of the desperation of the ruling class for some improvement at this stage. Keynesianism has been partially tried and failed but this does not mean that, faced with a revolutionary explosion, the capitalists would not resort to far-reaching Keynesian measures. Concessions can be given and then the capitalists will attempt to take them back through inflation at a later stage. Even now, the EU authorities are attempting to avoid the default of Greece by suggesting that more time is given for its debts to be paid off. This will not prevent the savage attacks on the Greek working class, which are being applied remorselessly by the EU. Nor will it solve the basic problems of Greece which will still be lumbered with colossal debts. Therefore, a Greek default is still likely, which will have huge repercussions throughout Europe, including Germany, which is heavily indebted to the banks of other countries. It is even possible that Germany itself could take the initiative of leaving the euro, such is the political opposition within Germany itself to bail-outs. Even the proposal to give Greece more time to pay off its debts is meeting with opposition from the German capitalists because it means writing off a small portion of their debt. It is possible that, in relation to Spain and some other countries, the ‘can will be kicked further down the road’. But eventually the can will become too big to kick! Therefore, a breakup of the eurozone still remains on the cards. Even the Chinese express alarm at the turn of events in Europe with a top Chinese official, Ji Liqun, sitting on top of a massive state-controlled sovereign wealth fund of £300 billion, warning that the European public are at ‘breaking point’. He had previously argued that Europeans should work harder but now recognises that the depth of public anger could lead to a ‘complete discarding’ of austerity programmes. "The fact the public are taking to the streets and resorting to violence indicates the general public’s tolerance has hit its limits", he commented. "Unions are now involved in organised protests; demonstrations and strikes. It smacks of the 1930s". Not least of his unspoken concerns is that the example set by the European working class could spill over into China itself as well as his fear for Chinese investments in Europe. EUROPE IS THE key to the world situation at the present time, where the class struggle is at its sharpest and with the greatest opportunity for a breakthrough for left and revolutionary forces. But if this is so, then Greece is therefore the key to the situation in Europe, with Spain and Portugal not far behind in the chain of weak links of European capitalism. As Trotsky said of Spain in the 1930s, not one but three or four revolutions would have been possible if the Greek workers had a farsighted leadership and mass party at their head. A Greek computer programmer on the day of the recent general strike commented to the Guardian newspaper in Britain: "Personally, I’m amazed there hasn’t been a revolution". British TV also commented that just 3% of the population actually supports the austerity measures of the government and the troika. With all the agonies that the Greek people are being forced to endure, by the end of the present austerity programme the debt of Greece will still be 192% of GDP! In other words, there is absolutely no chance that this debt will be paid. Nevertheless, endless austerity is the future that capitalism has decreed for the Greek people. All the conditions for revolution are not just ripe but rotten ripe. Nineteen one-day general strikes – out of which four have been 48 hour strikes and the rest 24-hour strikes – testify to the colossal reserves of energy of the Greek workers and their preparedness to resist. However, they have concluded that, in the teeth of what has been a magnificent struggle, the troika and the Greek capitalists have still not budged and it is therefore necessary to turn to the political front, towards the idea of a left government able to show a way out of the crisis. This is despite the fact that there is scepticism towards Syriza and its leadership on the part of the masses. Significant sections of the masses are prepared to support Syriza, which currently receives as much as 30% in some of the polls, but are not prepared to join and actively engage within its ranks. There is an element of this in many countries. Big disappointment at the failure of the workers’ parties has led to extreme scepticism towards them, even those formally standing on the left. There is a willingness to support left formations and parties in elections, but not to devote time and energy to engaging in their ranks and building them. Workers have been disappointed in the past and fear being let down once more. This mood, of course, can and will be changed once they see these parties actually carrying out what they promise. Instead of moving in a leftward direction, however, left parties in general and Syriza in particular have tended to move to the right, watering down their programme and opening their doors even to ex-leaders of social democracy who have played an open strike-breaking role in the very recent period. In the circumstances of Greece, the flexible tactics employed by our Greek comrades, while remaining firm programmatically, meet the needs of a very complex situation. We have to have an eye not just for those left forces within Syriza but also to the sizeable forces outside, whom in some cases are re-evaluating past political positions. We cannot give a timescale as to when the present government will collapse – as it surely will – with the likely coming to power of a Syriza-led left government. But we have to prepare for such an eventuality with the aim of pushing such a government towards the left, while at the same time helping to create democratic popular committees which can both support the government against the right but also pressurise it into taking measures in defence of the working class. It is not beyond the bounds of possibility that a new significant semi-mass force can emerge through the tactics in which we are presently engaged. This will involve not just a concentration on developments on the left and in the workers’ parties but also against the danger posed by the far right and specifically from the rise of the fascist Golden Dawn, whose support recently rose to 14% at one stage in the opinion polls, but has now declined to around 10%. One of the reasons for this is the formation of mass anti-fascist committees, which we have helped to initiate and have drawn in workers, youth and refugees. This work assumes exceptional importance and could be a model for the kind of situation that may confront the working class in many other countries in the future. The capitalists, in the first instance, are more likely to resort to a form of parliamentary Bonapartism, like Monti’s government in Italy but more authoritarian. The fraught economic and social position of Greece will demand a much firmer and more pronounced right wing government than in Italy, with the powers to overrule parliament in an ‘emergency’. If this does not work, and a series of governments of a similar character are incapable of breaking the social deadlock, and if the working class, through a revolutionary party, fails to take power, then the Greek capitalists could go over to an open dictatorship. We have to warn the working class that we still have time in Greece but we have to utilise this in order to prepare a force that can carry through socialist change. The response throughout Europe to the strike on 14 November illustrates how the struggles of the working class are bound together. If the Greek workers were to break the chain of capitalism and appeal to the workers of Western Europe, at the very least to those in southern Europe, there would be a big response to the call for a socialist confederation – probably involving Spain, Portugal and maybe Ireland in the first instance, if not Italy. US IMPERIALISM HAS identified Asia as a key area – more important than Europe, for instance, strategically and economically – shown by the fact that the first visit of Obama after his victory in the US presidential election was made to the region. This was partly to reaffirm the economic stake of US imperialism but also served as a warning to China of the importance of US military strategic interest. It was felt to be necessary because of the new military assertiveness of China, which was revealed in its recent naval clashes with Japan over uninhabited disputed islands. Japan is beginning to build up its military forces, of course, for ‘defence’ alone! This means that Asia will become a new and dangerous theatre of military conflict with the rise of nationalism and the possibility of outright conflict, where the contending powers will be prepared to confront each other, with weapons if necessary, in order to enhance their influence, power and economic stake. China is the colossus of Asia, the second power in the world after the US. How it develops will exercise a big, perhaps decisive, effect on the region and the world. And China is certainly at the crossroads, as its ruling elite well understands. Like many a ruling group in history, it feels the contradictory tensions swelling up from below and is unsure how to deal with them. Chinese scholars described the current situation of the country to The Economist as "unstable at the grassroots, dejected at the middle strata, and out of control at the top". In other words, the ingredients of revolution are brewing in China at the present time. The spectacular growth rate of 12% is a thing of the past. It is now like a like a car stuck in snow: the wheels churn but the vehicle does not advance. Growth has probably contracted to between 5% and 7%. The regime claims that there has been a certain ‘recovery’ but it is not expected to return to double-digit growth. This will automatically affect perspectives for the world economy. A growth rate above 10% was only possible through a massive injection of resources, at one-time amounting to a colossal and unprecedented 50% of GDP invested into industry. This, in turn, generated discontent: resentment against growing inequality and environmental degradation as well as communally-owned land being illegally snatched by greedy officials. Many of the protagonists naïvely believe that if only the lords in Beijing knew the scale of corruption, they would intervene to stamp it out. Something similar occurred in Russia under Stalinism. The masses initially tended to absolve Stalin of any responsibility for corruption of which he was ‘unaware’. It was all down to the crimes of the local bureaucracy but not Stalin himself. But the arrest of Bo Xilai and trial of his wife have helped to dispel those illusions. He has been accused of abusing his position by amassing a fortune, accepting ‘huge bribes’, and to have promoted his cronies to high positions. Bo, as a member of the top elite – a princeling, a son of a leader of the Chinese revolution – is accused of complicity in murder, bribery and massive corruption. This naturally poses the question of how he was allowed to get away with this for so long. In reality, it was not these crimes – true though they probably are – which led to his arrest and impending trial. It was because he represented a certain danger to the top elite – in going outside this ‘magic circle’ – and campaigning for the top job. Even more dangerous was that he invoked some of the radical phrases of Maoism, associated with the Cultural Revolution. In so doing, he could have unconsciously unleashed forces that he would not be able to control, which could go further and demand action against the injustices of the regime. And who knows where this could have ended? The Chinese regime is in crisis. It is quite obviously divided as to the next steps – particularly in relation to the economy – which should be undertaken. One princeling commenting to the Financial Times put it brutally: "The best time for China is over and the entire system needs to be overhauled". Bourgeois commentators in journals like The Economist, the Financial Times, the New York Times, etc, have recently resorted to the terminology which the CWI has used in describing China as ‘state capitalist’. They do not add the proviso that we do, of ‘state capitalist, but with unique features’. This is necessary in order to differentiate our analysis from the crude position of the SWP and others, who incorrectly described the planned economies in the past in this fashion. The direction of travel of China is clear. The capitalist sector has grown at the expense of the state-owned enterprises (SOEs) in the past. But recently, and particularly since the stimulus package of 2008, there has been a certain recentralisation with economic power tending to be concentrated more in the state sector, so much so that SOEs now have assets worth 75% of total GDP. On the other hand, The Economist described China in the following fashion: "Experts disagree on whether the state now makes up half or a third of economic output, but agree the share is lower than it was two decades ago. For years from the late 1990s SOEs appeared to be in retreat. Their numbers declined (to around 114,000 in 2010, some 100 of them centrally controlled national champions), and their share of employment dropped. But now, even while the number of private companies has grown, the retreat of the state has slowed and, in some industries, reversed". It is clear that a ferocious discussion is taking place behind closed doors amongst the elite. ‘Reformers’ favour a more determined programme of dismantling the state sector and moving more and more towards the ‘market’. They are proposing to lift remaining barriers to the entry and operation of foreign capital. The new ‘leader’ Xi Jinping, despite his ritualistic incantation of ‘socialism with Chinese characteristics’, is rumoured to support the reformers. On the other hand, those who have proposed an opening up, both in the economy but also with limited ‘democratic’ reforms, seem to be side-lined. Studies have been made of how former dictatorships like South Korea allegedly managed the ‘cold transition’ towards ‘democracy’. These took place when the boom had not exhausted itself and even then was against the background of mass movements. China’s proposed ‘transition’ is taking place in the midst of a massive economic crisis. China’s rulers are rumoured to be avidly studying Gorbachev’s role in Russia. He began intending to ‘reform’ the system and ended up presiding over its dismantlement. Serious reforms from the top will provoke revolution from below in today’s China. It cannot be excluded that a period of very weak ‘democracy’ – but with power still in the hands of the old forces, like in Egypt today with the army and the Muslim Brotherhood in power – could develop after a revolutionary upheaval in China. But this would be merely a prelude to the opening of the gates to one of the biggest mass movements in history. FOUR TO FIVE years into a devastating world economic crisis, we can conclude that there are very favourable prospects for the growth of the Marxism. With the necessary qualification that consciousness – the broad outlook of the working class – has yet to catch up with the objective situation, it can still be described as pre-revolutionary, especially when taken on a world scale. The productive forces no longer advance but stagnate and decline. This has been accompanied by a certain disintegration socially of sections of the working class and the poor. At the same time, new layers of the working class as well as sections of the middle class are being created – proletarianised – and compelled to adopt the traditional methods of the working class of strikes and trade union organisation. The potential power of the working class remains intact, although hampered and weakened by the right-wing trade union leadership as well as by social democracy and the communist parties. 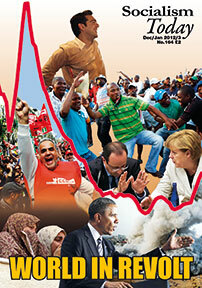 The CWI has not made a decisive breakthrough as yet in any country or continent. However, we have retained our overall position in terms of membership and especially increased influence within the labour movement. There are many workers who are sympathetic to and watching us, and on the basis of events and our work can join us. We must face up to the situation by educating and preparing our supporters for the tumultuous next period in which great opportunities will be presented to strengthen the organisations and parties of the CWI and the International as a whole.